​If you haven’t heard the name you’ll have to get out more! Catch Fraze are the Illawarra’s hottest duo. Over the years these guys have built a reputation that always has the crowds begging for more here on the south coast and also on the gold coast. With a repertoire from 50’s 60’s R&R to 70’s/80’s retro to top 40 hits of today, and many great classics along the way, “CATCH FRAZE” delivers a mixed bag of songs that is sure to please any party goer. “CATCH FRAZE” have built up a dedicated group of patrons that support their shows at a lot of their regular gigs around the Illawarra, south coast and Gold Coast; and they never fail to recruit new blood at any new venues. Why? When vocalist/Guitarest Darryl Apps is not telling jokes and clowning around on stage, he is singing up a storm with some great rock, country and ballads from the past and present. Darryl’s powerful vocal range is vast enabling him to sing all the favourites from Cold Chisel to Matchbox 20 as well as Robbie Williams and a vast array of Country Rock. Ronnie Wiggins has just about done it all from rock, country jazz as a guitar player and singer in pubs, clubs and restaurants to being the front man in his own Country show. Ron has been all over the country entertaining the masses and can adapt to all styles. Which proves he truly is a fine artist. 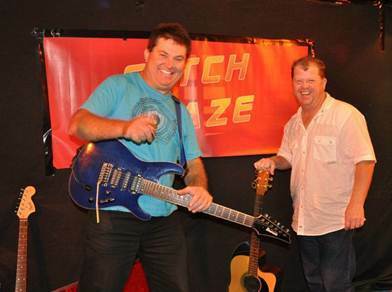 Together with Darryl’s rhythm guitar and Ron’s vocals, working together over the past 6 years DAZ & RON in “CATCH FRAZE” have made a connection, and developed a hot duo that has something for everyone, and is in big demand!! !